• Medication that is improperly taken or abused is a leading cause of accidental poisoning. • Unused or expired medications that are thrown out with trash or flushed can pollute the environment. 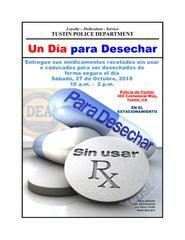 This event is a National Take-Back Initiative designed to remove potentially dangerous prescription drugs from our community. 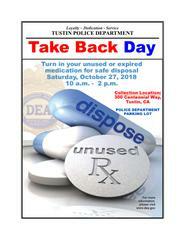 Citizens who want to dispose of any unwanted or unused prescription drugs can safely dispose of them from 10:00 AM to 2:00 PM in the parking lot of the Tustin Police Department located at 300 Centennial Way, Tustin, CA 92780.